John Deere 9RX Series Tractors were awarded the Good Design™ Award for innovative and cutting-edge design. John Deere has announced that its 9RX Series Tractors have been awarded the Good Design™ Award for 2017 from the Chicago Athenaeum Museum of Architecture and Design. The award is typically given to companies for equipment that shows innovative and cutting-edge design. "The Good Design Award is the result of the extraordinary dedication and talents put forth by our team of engineers and designers of the powerful, efficient and smart 9RX Series Tractors," said Janet Willett, engineering manager for 9RX Series Tractors. Design professionals, industry experts, and media came together to decide on the winner of this year’s award. Some of the criteria that needed to be met included innovative design, new technologies, form, materials, and construction. 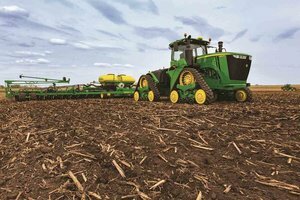 “Our team of engineers worked diligently to deliver the reliable tractor John Deere is known for, and that ultimately helps our customers farm more productively,” Willett continued. Willet went on to say that when the 9RX Series Tractors were designed, operator comfort and ride quality were taken into consideration. “This suspension provides the smoothest ride in the industry for a track tractor and isolates the operator from unwanted bumps and vibrations while reducing operator fatigue,” she explained. The 9RX Series Tractors offer several industry-leading features, including the CommandView™ III cab, Generation 4 CommandCenter™ controls. More information on the tractors and other Deere equipment can be found by visiting www.Deere.com.